NBC’s Powerless is shaping up to be one of the more interesting shows on the upcoming winter TV schedule, injecting some comedy into the frequently humorless world of the DC Universe. The series has undergone extensive changes in its attempts to blend workplace sitcom antics and superhero mayhem, though; most notably in the decision to change its setting, a generic insurance company, into a subsidiary of Batman’s corporate piggy bank, Wayne Enterprises. The change also meant a (non-superheroic) transformation for Alan Tudyk’s boss character, changing him into Van Wayne, a dim-bulb cousin to Bruce. Halpern and his co-EP, Patrick Schumacker, are clearly conscious of the capes-and-tightsrope they’re walking with the Vanessa Hudgens-starring series, tapping into the name recognition of their parent universe while also wanting it to stand as its own, separate thing. “We make it a point not to use Batman and Bruce Wayne as a crutch,” Halpern said. “We don’t lean into that past the pilot that much.” Meanwhile, they’ve also developed strategies to slip jokes and character ideas past their corporate overlords. 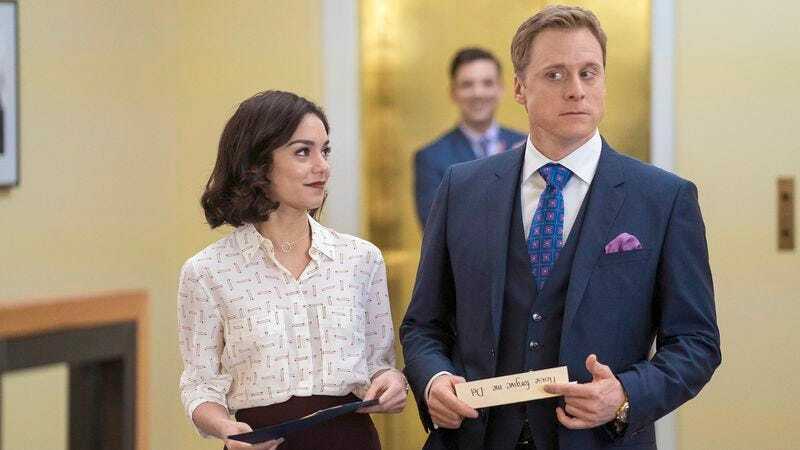 “The lesson I’ve learned it to ask for everything,” Halpern said, “Or, just go with it and get a laugh at the table read and then they’re stuck.” Powerless debuts on February 2 on NBC.